2nd Annual ‘Helmets for Hydro’ Auction is Live! We’re pleased again for the second year running to offer our ‘Helmets for Hydro’ eBay charity auction. Lead by action sports icon Travis Pastrana and leading Supercross and Motocross stars, we’ve assembled a great collection of very hard to find autographed race helmets for bidding. “Hydro” is short for “Hydrocephalus” — the #1 cause of brain surgery in kids which affects one million people in the United States. The funds raised from the auction benefit hydrocephalus research at leading Children’s Hospitals including: Toronto’s SickKids, Seattle Children’s, Utah’s Primary Children’s, Children’s Hospital of Alabama, St. Louis Children’s, Pittsburgh Children’s and Houston’s Texas Children’s Hospital. In addition to Travis, racers donating this year include Ryan Dungey, Trey Canard, Ashley Fiolek, Andrew Short, Justin Barcia, Eli Tomac, Davi Millsaps, and Brett Metcalfe. “For the second year in a row I am joining up with MX for Children for their Helmets for Hydro auction. I’m proud to be able to donate one of my THOR race helmets” said Brett Metcalfe, Team Rockstar Makita Suzuki Factory Rider. “As racers, it is important to give back to our communities and for me it’s honorable and meaningful to help kids in need”. The auction begins on November 22, 2011 at 8:00AM PST on eBay and runs for one week. 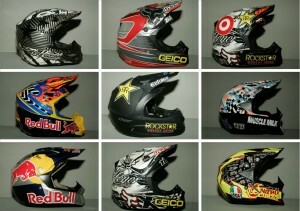 You can find it on eBay here or by clicking on the picture of the helmets. Good luck! This entry was written by admin, posted on November 21, 2011 at 8:00 pm, filed under Uncategorized. Bookmark the permalink. Follow any comments here with the RSS feed for this post. Post a comment or leave a trackback: Trackback URL.